Well-known around the world for its palaces, forts and sand dunes, Rajasthan is also home to some of the most important pilgrimage centres for various religions. Come discover one. Infinite mounds of fine sand, large stretches of parched land, scanty greenery, prickly cacti, endless mirages across hamlets of mud houses, camels deep in thought and chewing away the three-odd leaves to glory and nomads on the lookout for water under the scorching sun is the typical image of a day in the Thar, the desert that traverses large parts of Rajasthan. Covering 150,000 sqkm or almost half the area of Rajasthan, the Thar is a very colourful and historic desert, with numerous forts and exotic palaces sprinkled like the oases across the golden sands. It is also about the vibrant communities of the locals, their colourful dresses, vibrant festivals, sumptuous cuisines, maze of old town alleys adorned with rich handicrafts and intricately carved temples, some very famous but many of them largely unknown outside the state. 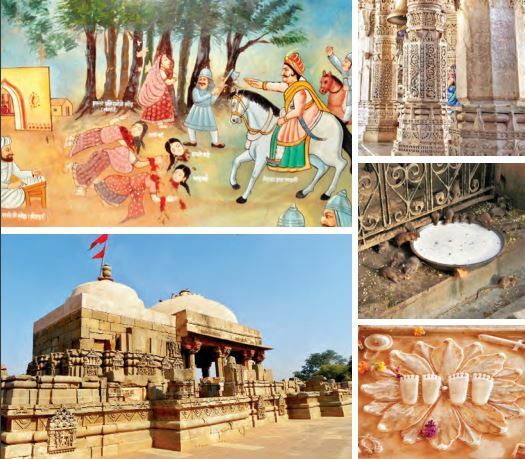 While I had spent more than six years dwelling in various regions of Rajasthan, my interest in ancient architecture and heritage made me wander in pursuit of the lesser-known spiritual havens. On one such winter pursuit from Barmer to Jodhpur in western Rajasthan, we stumbled upon a signboard at a place called Balotra in the Thar desert that directed us to ‘NakodaJi’. The name rang a bell and I recollected seeing umpteen photo frames perched on wall shelves with reverence, in the Marwari shops back in Hyderabad and Madurai. Yes, many of these Rajasthani traders have made south India their home and they are one of the most affluent and hardworking communities settled in the south. It piqued my interest and we took a detour towards Nakoda, driving along the banks of the west-flowing River Luni that had acres of parched riverbed with just some blobs of water here and there. Suddenly, as we drove ahead the landscape changed from arid to lush green. I wondered if we had reached a hilly area as mist surrounded us when we entered through a gateway that marked the entrance to the pilgrim town of Nakoda. The road led to a small, quiet hillock, with hardly any hobnob around the place as is usual with spiritual places in India. We entered the temple premises and against the backdrop of a white facade of shrines were pilgrims in attires of every possible colour. A sense of calmness pervaded even amidst this swarm of devotees. There were statues of Hindu goddesses adorning the facade of a marble temple onour left, a cluster of rooms and entrances on our right and two giant elephants with mahouts in front of us. I wondered which of the structures should we be entering and if it was just a Jain temple after all. Jainism and Buddhism stem from Hinduism and originated in India but the fact that the temple premises had a separate Hindu complex was intriguing our doubts were put to rest as one of the pilgrims said, ‘‘Both Bhairava (a Hindu god) and Parshvanatha (the 23rd Jain Tirthankara or Guru) are worshipped here. Offer your prayers soon as it is less crowded now.’’ We walked to the Parshvanatha temple, through the doors, guarded by sculpted elephants. This 58-inch black idol is believed to have been unearthed at Sindhuri, on the banks of River Luni and installed here at Nakoda which now is a pilgrimage centre for the Shwetamabar sect of the Jains. The legend goes that in the 3rd century, two brothers, Virsen and Nakorsen, built the temple and the idol was installed here later by a Jain saint. The temple town of Nakoda was earlier known as Mewanagar and has been known as Nagara, Viramapura and Maheva at different times during the course of history. When Alamshah invaded this place in the year 1224, the local Jains are said to have kept the idol hidden in the cellar of Kalidrah village for protection. Over time this temple was renovated many times and finally, the main idol of Lord Parshvanatha in a sitting posture was brought along with 120 more idols that had been hidden from the invaders and reinstalled in the temple premises. Interestingly, the temple complex is still seeing expansion and renovations. The simple facade of the temple appears to be a deliberate attempt to protect the beautiful interiors, with their intricate carvings adorning the pillars and structures inside. The fine chiselled white and pale pink pillars are a marvel. I spent nearly an hour running my fingers over the nuances that were carefully sculpted on each pillar. Celestial beings, flowers, animals and even the Hindu pantheon were all beautifully presented. Unlike the exquisitely carved Ranakpur Jain temples or the Dilwara Jain temple that witness a huge influx of tourists as well as the devotees, Nakodaji temple welcomes mainly the devotees, who visit to ask for boons or thank the deity for having granted their wishes. In spite of having prominent industrialists and Bollywood stars on the list of its devotees, Nakodaji still remains a largely unknown pilgrimage centre of Rajasthan. If you are heading towards Barmer from Nakoda, do not forget to honk thrice as you drive past the ‘Patthar Baba’ temple, where a rock is the deity. It accepts offerings of whisky alone and if you don’t honk thrice you run the risk of being cursed by the Patthar Baba! The local superstition says that many of those who didn’t honk thrice met with accidents and died on the road. Some of Rajasthan’s opulent palaces, forts and architectural marvels look invincible perched high on hills, defining the skylines, while the others with their rustic facades are cocooned away and remain obscure in the wheatish wilderness. Rajasthan is indeed eclectic and a land of contrasts. The Nakodaji temple remains obscure in the wilderness of the Thar despite being close to Jodhpur, a major tourist attraction. Similar is the fate of the Harshat Mata (The goddess of happiness) temple, about 100 km east of Jaipur in Dausa district. 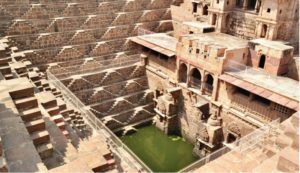 Thousands of tourists from all over drive to Chand Baori, a famous step well with over, 3,500 steps descending 11 levels below and that is believed to be over 1,000 years old as well as the deepest stepwell in the world. It has already featured in numerous films notably The Fall, and The Dark Knight Returns. However, only a few would even know when they cross the Harshat Mata Temple, even though both date from the same period. The temple and the stepwell were both built by Raja Chand (also known as Chandra), a Rajput ruler of Abhanagari, known as Abhaneri today. The stepwell served as a water source in the arid desert and also as a place for social gatherings in the 8th and 9th centuries. Built on an elevated plinth with steps that lead to the sanctum, this temple has been rebuilt several times by the locals following repeated destructions, mainly by Muslim invaders. Though it was first built in the usual Nagara style architecture like other temples of north India, it now has a dome-shaped shikhara or spire. Maybe this was deliberately shaped to avoid further destruction by invaders. The temple boasts of exquisite carvings that seem to come alive as you approach them. From the celestial nymphs dancing away to glory and a group of women frolicking around, to a husband cajoling his wife. Each of these moments is chiselled precisely with their emotions clearly visible even today. Each face displays exuberance and happiness, perhaps due to the proximity to the goddess of happiness! 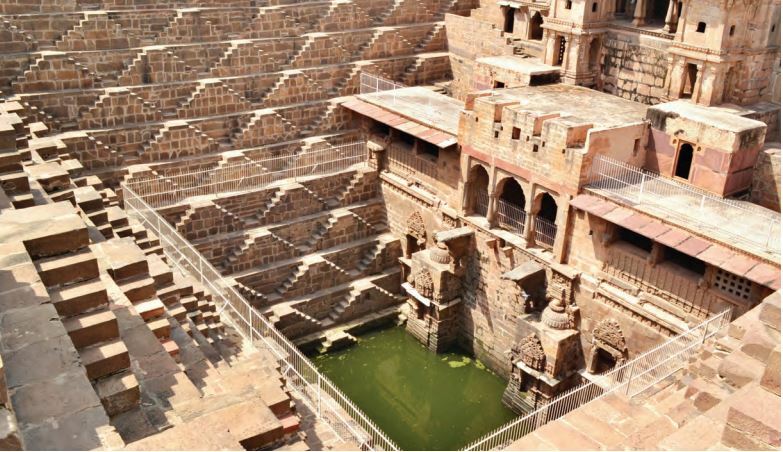 Many sculptures and idols from the Harshat Mata temple have either been sent to various other museums or shifted for display in pavillions around Chand Baori. A number of panels and blocks of the shrine are still lying around the temple, like pieces of a jigsaw puzzle to be put together one day. Rajasthan is unique in many ways and spirituality runs through the span of the desert as an undercurrent. It is a cauldron of varied forms of worship. The Bishnoi tribes worship and treasure the Kejri trees and could go to any extent to protect them as part of the eco-religion that they practice. Rats are worshipped in the Karni Mata temple at Deshnok near Bikaner in north Rajasthan, not to forget other exotic shrines like the Patthar Baba! Apart from this, one can find numerous temples dedicated to the child form of Hanuman, the monkey god, also referred to as Lord Balaji. This is not to be confused with Lord Balaji, most famously installed in Tirupati temple in Andhra Pradesh in south India! From animate to inanimate, every aspect of this universe is protected, preserved and revered in this region much like the rest of India. Rajputs show their respect and reverence to the departed by building cenotaphs, which could easily be mistaken for temples owing to their architecture and craftsmanship. Some ladies of royal families who have committed sati or jauhar (self-immolation upon death of the husband) in the past are revered as sati mata (sati mother). One such chhatri (cenotaph) where locals still perform prayers is in Alwar. This region was known as matsya pradesha (land of fish) aeons ago with its capital at Viratanagari. The cenotaph is known as Moosi Maharani ki Chhatri. Footprints of king Bakhtawar Singh and his queen Moosi, who had committed sati are worshipped every day by the locals, even though sati has been long banned in India. The cenotaph is a blend of Indo-Islamic architecture and one can also spend time along the Sagar Lake that adjoins it. 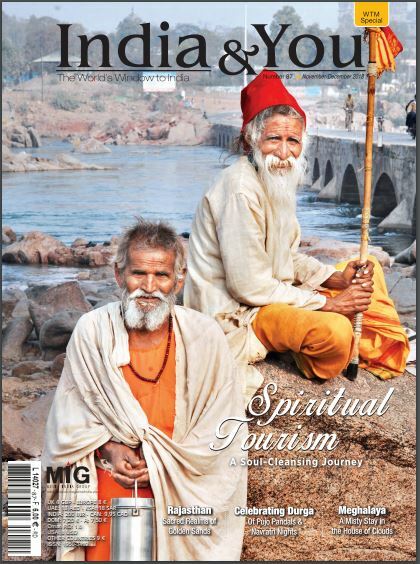 • The Bishnoi tribes embraced eco-religion under the guidance of a 35 year-old villager Guru Jambeshwarji in 1542. • He prescribed 29 tenets to his followers who were called Bishnois (Bish means twenty and Noi stands for nine). • These rules were woven around conservation of environment and ensured a healthy and eco-friendly social life for the tribe. • The Bishnois refrain from killing animals, eating meat, protecting the trees with their life and wearing blue clothes (as the dye for which is obtained by killing trees in the area). • The blackbucks and chinkara that roam freely in the wilderness of the Thar owe their existence to the presence of the Bishnois. • The Chipko movement was inspired by the sacrifice of Amrita Devi, a member of the Bishnoi community who was beheaded for protecting the trees. • There are many tour operators who provide guided trips across the Bishnoi villages around Jodhpur, Bikaner and Jaisalmer for tourists.